Usage: Apply a generous amount to clean skin and let it work its moisturizing and smoothing magic for 5-10 minutes. Rinse off with water to reveal your ultra hydrated, gorgeous complexion. Ingredients: Water (Aqua), Aloe Barbadensis (Aloe Vera) Leaf Juice, Glycerin Propanediol, Sorbitol, Cocos Nucifera (Coconut) Oil, Cocos Nucifera (Coconut) Fruit Juice, Cocos Nucifera (Coconut) Water, Aleurites Moluccana (Kukui) Seed Extract, Hibiscus Sabdariffa Flower Extract, Morinda Citrifolia Fruit Extract, Musa Sapientum (Banana) Fruit Extract, Orchis Mascula Flower Extract, Psidium Guajava (Guava) Fruit Extract, Malus Domestica Fruit Cell Culture Extract, Honey, Allantoin, Lecithin, Algin, Galactoarabinan, Beta-Glucan, Heptyl Glucoside, Dipotassium Glycyrrhizate, Xanthan Gum, Tetrasodium Glutamate, Diacetate, Caprylhydroxamic Acid, Sodium Hyaluronate, Sodium Hydroxide, Benzoic Acid, Sorbic Acid, Phenoxyethanol, Fragrance (Parfum), Coumarin. This mask is great. I have very dry skin and my skin drinks up the first layer. The mask smells fantastic and is ultra creamy. Very glad I bought this. What a treat. 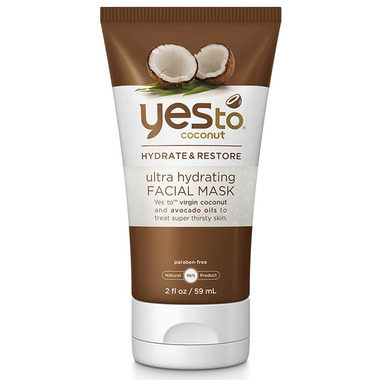 Very hydrating, even with justa thin layer, applies and removes easily. Has a smell that slightly reminds me of Play-dough but in a good way and is much preffered to added fragrance. It doesn't dry entirely like most masks do but I think that's why it removes quickly. The texture reminds me of the Sephora brand purple or white clay masks which I also love. Definitely will repurchase this one!